Today I made a card for 5 challenges. At Basic Grey, the challenge was to use summery images and papers for the "Sizzing Summer" challenge. I used papers from Basic Grey's "Lauderdale" collection. Just Magnolia & Hanglar Stanglar challenged us to "Holiday Fun" which could include summer vacation/summer holidays. An Oldie but a Goodie challenged us to use "Outdoor Fun." The Shabby Tea Room provided us with an inspiration photo (which we could elect to use or not) along with "Polka Dots." 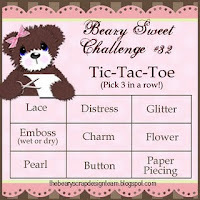 Finally, at The Beary Scrap, the challenge was a tic tac toe board. I used the diagonal: pearl, charm, and glitter. 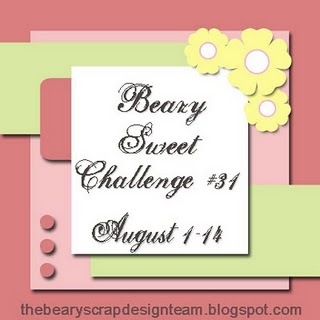 My layout comes from the last Beary Scrap Challenge (#31, sketch) which I just didn't have time to use. I loved the sketch though and had it sitting out on my work table, so I thought why not use it now? I colored Tilda using Copics, cut her out, and placed her on top of the inner tube. The glitter is added to the edge of her swimsuit ruffle and to the ripples. I used Copics and Prismacolor pencils to color the water. The sky is sponged SU! "Bashful Blue." The charm says "Love." Papers: White, black, all dps from Basic Grey "Lauderdale"
This is darling, I love your colors. Thanks for joining our challenge! This is fantastic, great layout, I love all those layers. Hi Sarah - lovely job on this card. I especially like the watercolor-y papers over the polka dot background and the cranberry touches. You did our sketch proud! Thanks so much for joining our Beary Sweet Tic-Tac-Toe Challenge - good luck! Thank you for playing with us at The Beary Scrap, awesome project. I hope to see you play with us again. Good Luck.